We offer two distinct models of whole house water filters...First, a simple single-stage 10" Big Blue for sediment filtration only, designed for wells, springs, cisterns or water systems containing sediment, rust, sand etc. Our second and most popular model whole house water filter is a two-stage unit that features a 4.5"x 10"five micron sediment filter and a 4.5"x 20" solid carbon block filter, for Chlorine, VOC's, organic impurities and more. The 2-Stage Whole House Filter features a replaceable solid Carbon Block filter designed to last for 30,000 gallons. 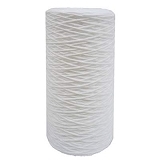 Use Coupon Code "wten" and save 10% on your whole house filter needs. Not designed for water supplies with possible bacteriological contamination. Use Coupon Code "wten" and save 10% on all your water filter purchases, except Multipure. 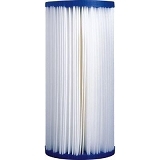 Bestfilters Two-Stage Whole House Water Filter - 2 Stages of deep filtration, manufactured from NSF/ANSI approved components and designed for Chlorine treated municipal water supplies. The replaceable 20" x 4 1/2" solid Carbon Block filter (our WR011) is manufactured to the highest standards and has a long replacement life of 30,000 gallons! The average family of 4 uses 5,000 to 6,000 gallons per month. Filters Chlorine, taste and odor, particulates, rust, sediment and much more from municipal drinking water. Not for well water or micro-biologically contaminated water.